Arabella is the daughter of a country vicar who is sent into London for the season to live with her Godmother in the hope of making a fortunate match. On the way to town, her carriage breaks down and she meets wealthy and sarcastic Robert Beaumaris. Arabella overhears him accuse her of being yet another girl only after his money and reacts strongly. Soon all of London believes her to be a wealthy heiress and Arabella finds herself caught in her own deception.I have to admit that I very much enjoyed Arabella. The writing was sharp, witty and events moved on at a good pace. 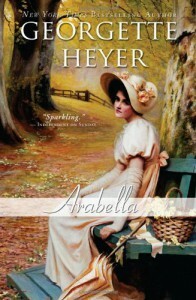 Arabella herself was a sympathetic main character as she wasn't perfect (although of course she was perfectly gorgeous), and it was easy to see her character develop over the course of the novel. Robert Beaumaris was a leading man in the mold of Rhett Butler, a man so fabulously rich he could think whatever he liked and have a sarcastic, half-joking, half-sneering manner, even though he's a bit of a softy underneath. I was rooting for the two of them to get together by the end of the book.I was also impressed with the historical setting of Arabella. It was clear that Heyer really understood the time period and consequently there were lots of small details about dress, meals and social events that I as a historical fiction fan definitely appreciated.Of course, I could argue that events in the novel were predictable, which they were. It's easy to see the consequences of Arabella's deception before they actually happen and what will happen between Arabella and Robert is obvious from their first meeting. But I was in a mood where I found the predictability comforting and Heyer still took me on a fun ride to the predictable ending. 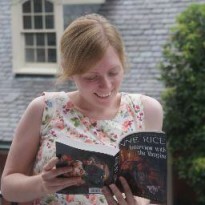 Arabella is a great comfort read for times when you simply want to lose yourself in a good story, well told. It's not going to change the world but I can guarantee you will have a smile on your face when you finish it.